Character Options have recently reveled a modified wave of series 4 figures. 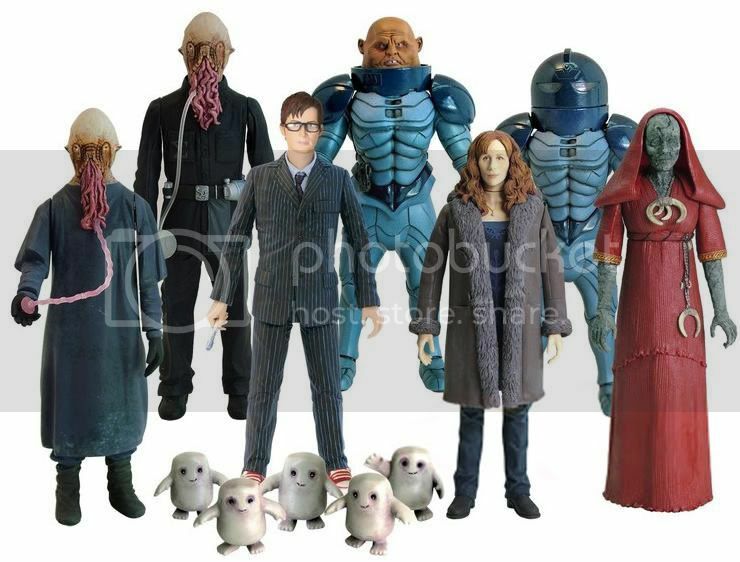 Character Options are releasing the Supreme Dalek, Davros, Donna, the Pyrovile Priestess, River Song, Sontaran Trooper, Sontaran General Staal, Ood Sigma, Natural Ood, Hath Peck and the Vashta Narada suit creature and also releasing 25 Adipose. Each figure will include a part to make a deluxe Vespiform. 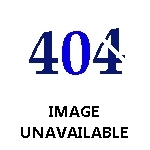 Both the wave of toys and Vespifrom are pictured below. The timelord figure is picture is not yet known if it will be included in the wave. Character Options have recently revealed the next wave of series 1, 2 and 3 toys. The wave includes Jabe, a purple Clockwork Droid, Captain Jack, Master in YANA clothes, Old and Ancient Doctors from Last of the Timelords, Astrid without apron and Bannakaffalatta. Each toy come with an extra part that when completed after all figures are bought will make a Gelth figure. Both the wave of toys and the finished Gelth are pictured below. Character Options have now released images and details of three deluxe toys due for release in January next year. The toys include a new version of the cyberleader voice changer helmet to accompany this years christmas special, also being released are Captain Jack’s vortex manipulator and The Journal of Impossible Things from the series 3 episodes Human Nature and the Family of Blood, both the vortex manipulator and the journal come with a mini sonic screwdriver that lights up the same way the full version does. 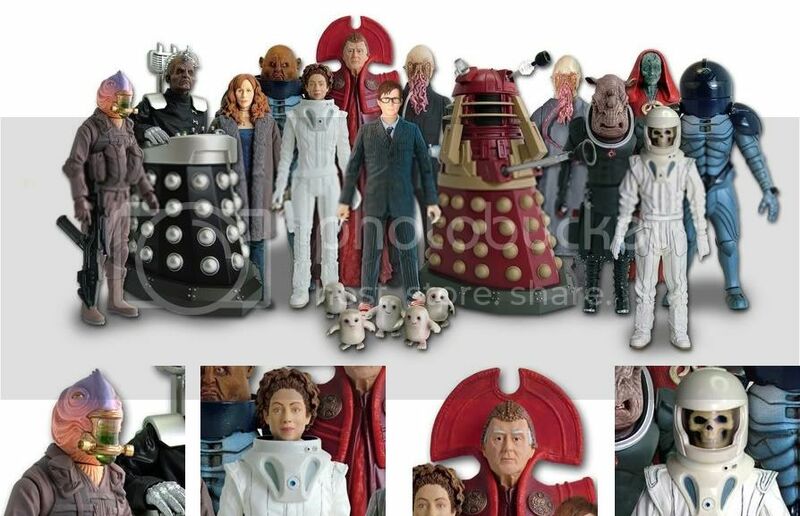 Character Options have released images of the second wave of series 4 toys, the wave update includes single figures of Davros and the Supreme Dalek, a Judoon in series 4 packaging and new figures include River Song, Hath, Vashta Nerada and a Timelord from series 3.
see all series 4 figures here. 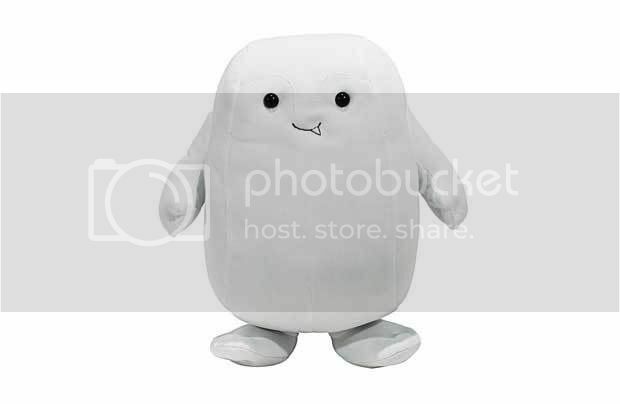 Character Options have released the first image of the Plush Adipose due for release this September. The Plush Adipose will be in most good toy stores and on the internet. The Adipose will retail at £9.99. Click here to see the full image. 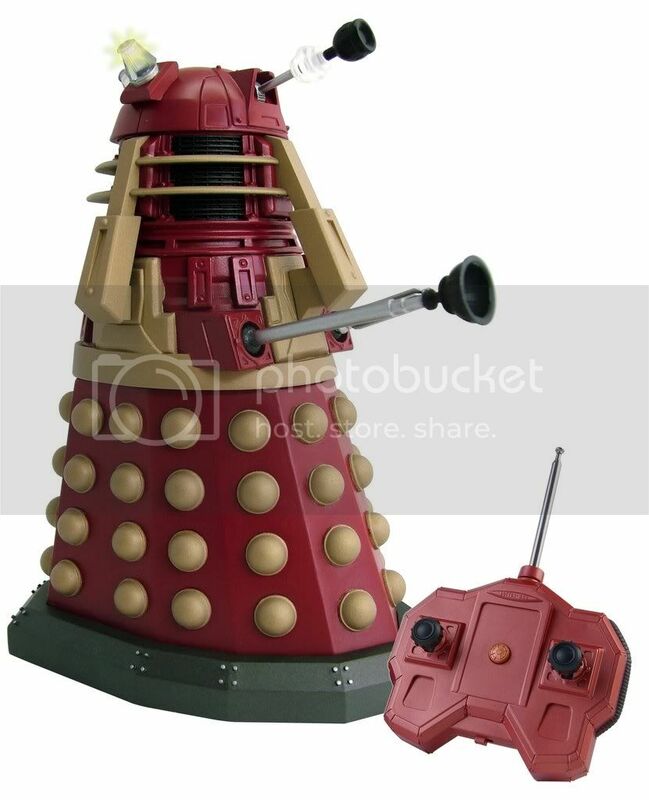 CO have released images of the 5″ radio controlled dalek due in shops any day now. The dalek will include motorised dalek movements and 10 supreme dalek phrases. Click here to see the dalek on it’s own and click here to see the dalek in character options new packaging. Thanks to Blogtor Who for the images. 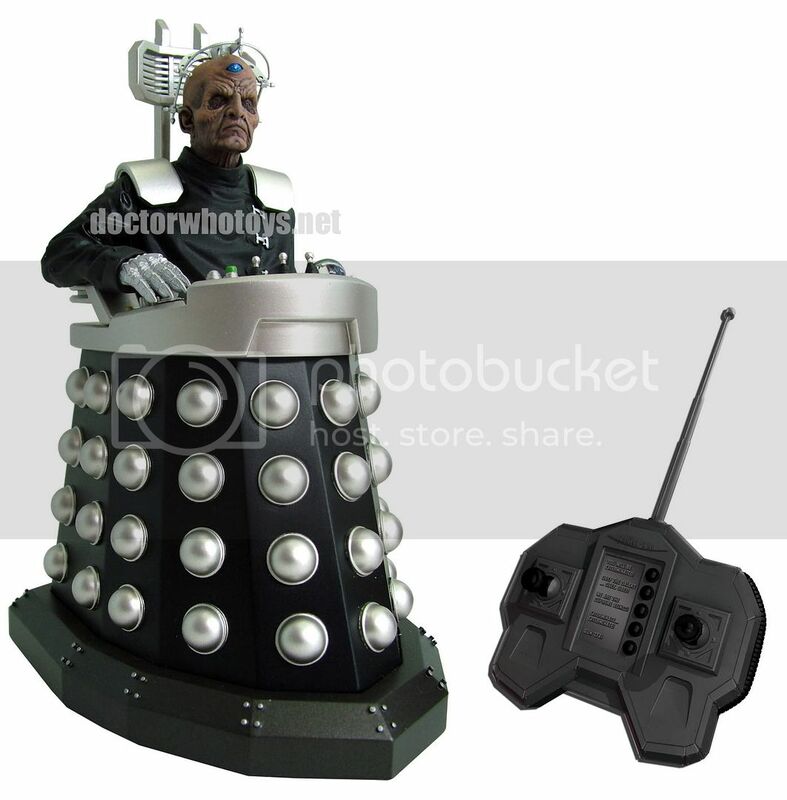 DoctorWhoToys.net have released the first image of the upcoming 12″ Remote Control Davros due to be released later this year. The voices on the image are subject to change on the final toy. 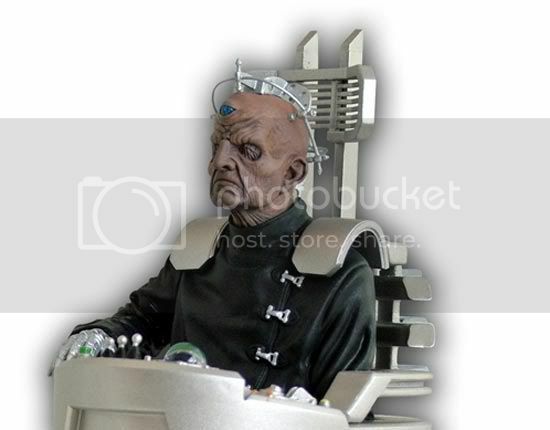 The rrp for Davros is £39.99. The full image if the toy can be seen here. 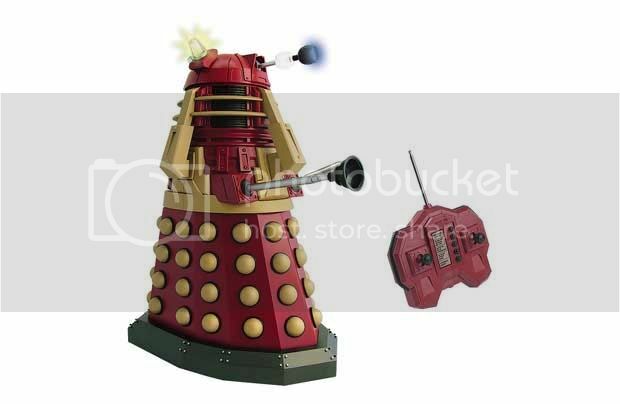 An image for the upcoming release of the 12″ Remote Control Supreme Dalek has also been released, the image of the toy can be seen here. 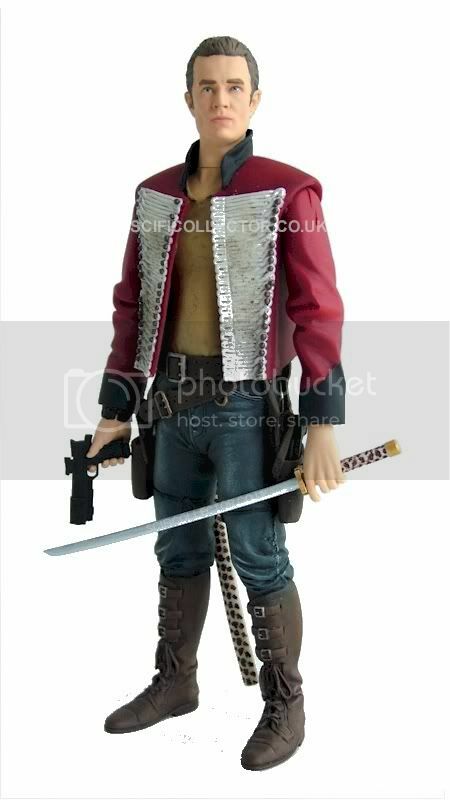 SciFi Collector have released the first image of the Captain John Hart figure due to be released in november. The figure includes 2 guns and a sword. The figure will join the blowfish (previously reported here), Ianto Jones, Toshiko Sato and Owen Harper in wave 2. 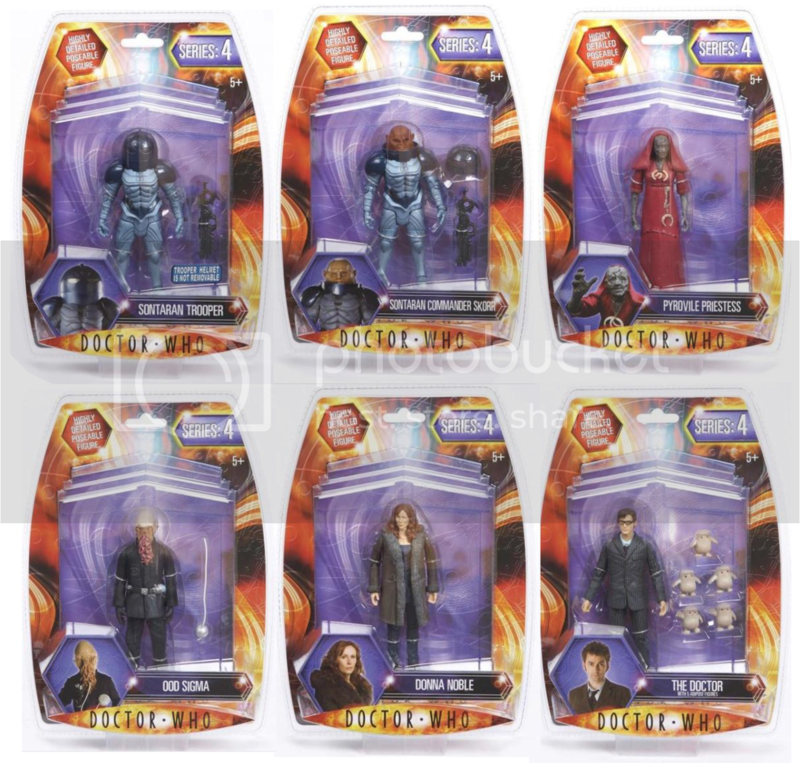 Wave 1 which includes Captian Jack, Gwen Cooper, a Weevil and the Cyberwoman will be released early-mid september. Character Options have released an image of an upcoming deluxe set. 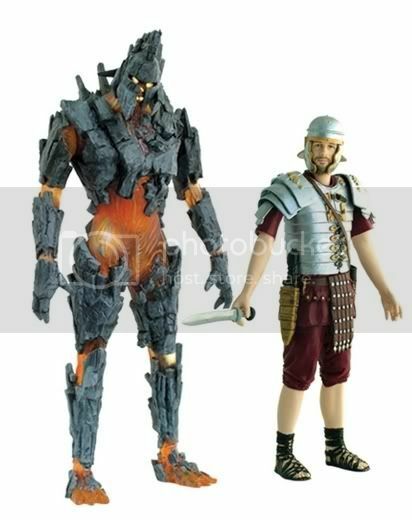 The set will will include an 8″ Pyroville and a 5″ Roman Soldier never seen on screen before. No release date or price has yet been announced but is likely to be in the region of £15.00 – £20.00. You can see a full image of the set here. Character Options have released images of The Stolen Earth Gift Set. 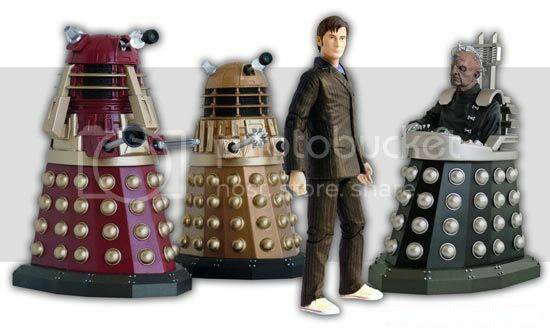 The set includes a brown suited Doctor, the Supreme Dalek, machine Dalek and Davros. 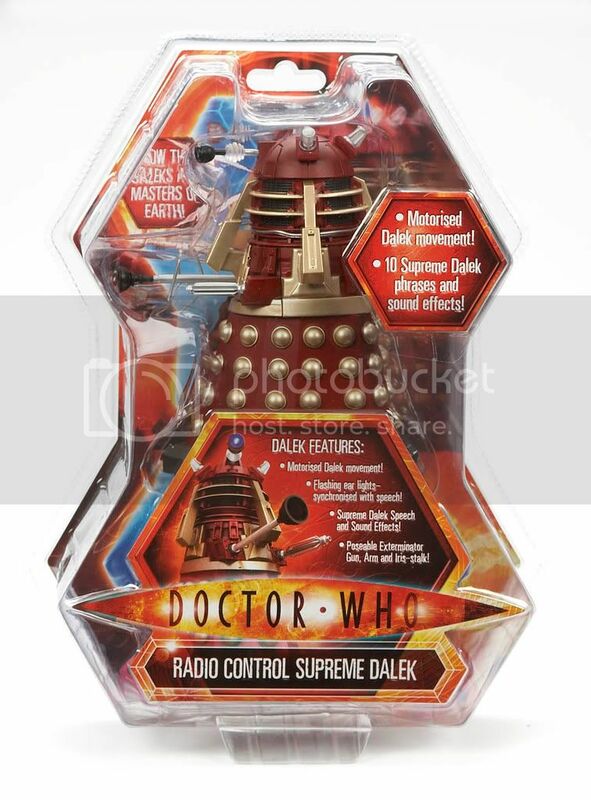 It has also been revealed that there will be a 5″ and 12″ Remote Controlled Davros and Supreme Dalek, both come with phrases used in the episodes, priced around £19.99/£39.99. The price for the set is likely to be around £19.99. 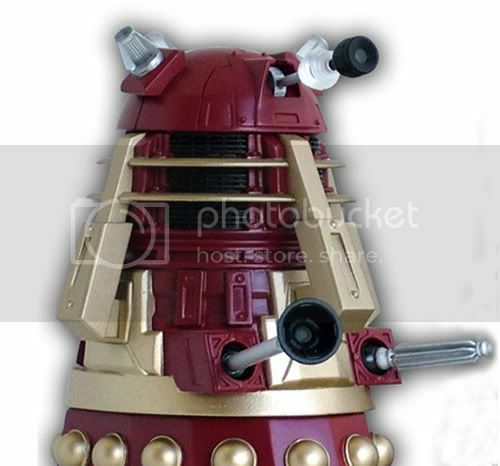 The Stolen Earth Set, Remote Controlled Davros and Remote Controlled Supreme Dalek are all released in the autumn. 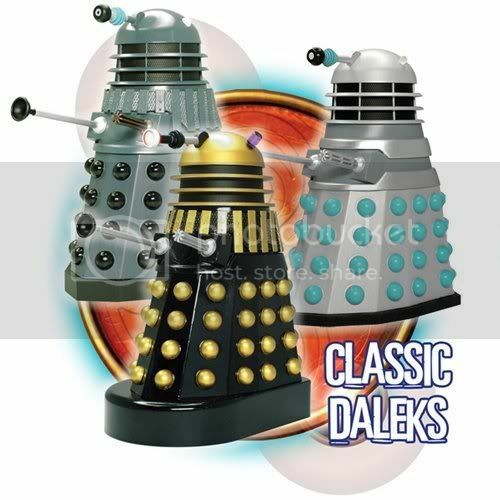 Character Options have released images of their up-coming set of 3 Classic Daleks. The Dalek variants include Daleks from the first doctor story The Dead Planet, the third doctor story Planet of the Daleks and the fourth doctor story Genesis of the Daleks. Images of the series 4 wave 1 toys in their carded forms have started to appear online. The colour for series 4 on the cards is a lilac-purple and stands out from the previous red, blue and green. The toys are released on 31st July priced £7.99 however some toy shops have already started selling them. a full image of all the carded toys can be found here (with thanks to tardis and torchwood treasures). 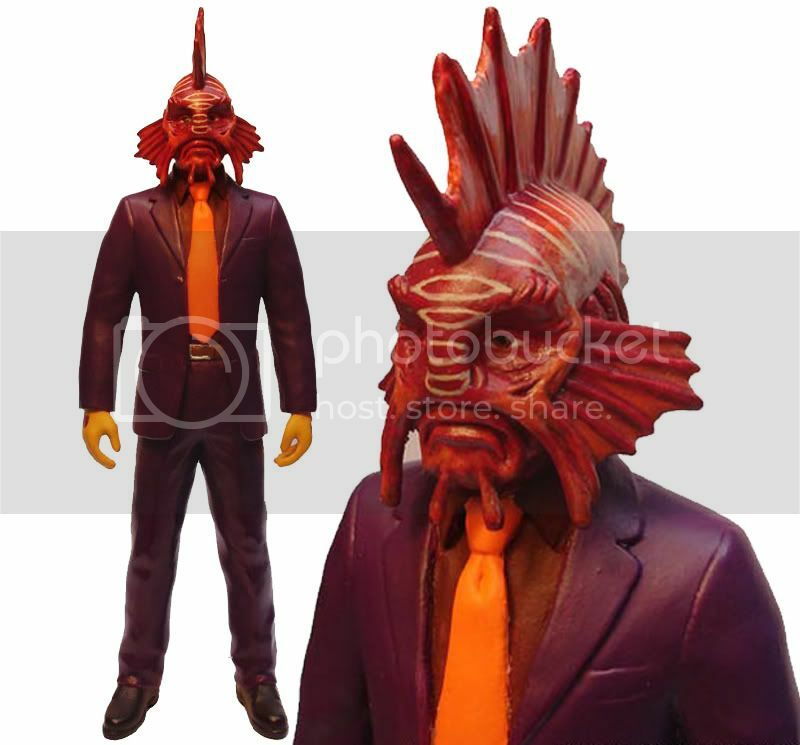 SciFi Collector have released the image of a new Blowfish toy from their second wave of Torchwood toys released later this year, also believed to be relaesed as part of wave 2 are Owen, Tosh, Ianto and Captain John. The First wave of the toys include Jack, Gwen, The Cyberwoman and a Weevil released in August they can be seen and pre-ordered here for £39.95. 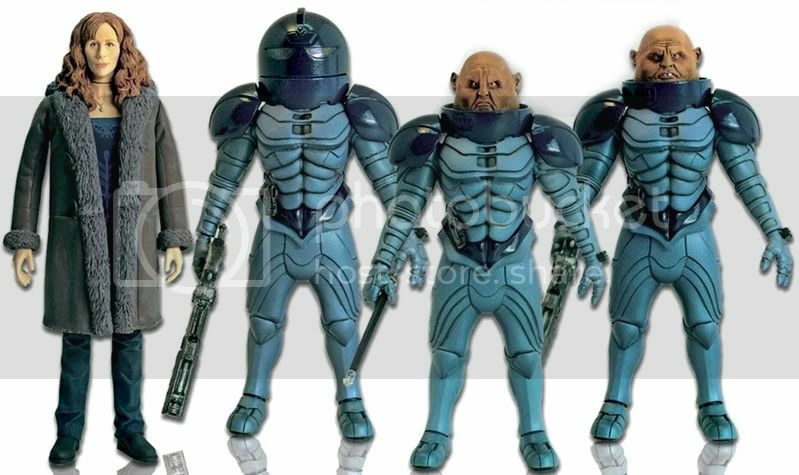 Character Options have released an image for their upcoming release of a Sontaran Gift Set, which includes 3 Sontaran figures, General Stall, Commander Skorr, and a helmeted Sontaran trooper, Stall and Skorr each come with removable helmet, the set also includes a Donna figure in the costume from Planet of the Ood.